Find hotel near Da Dong Roast Duck Restau ..
Da Dong Roast Duck Restaurant is one of the best places in the city to get a roast duck. The joint is known for its savoury food and scintillating drinks to gulp down your food. The restaurant is famed among locals and tourists for its distinctive taste and ambience that is sure to win your heart. So visit the destination and indulge in a treat for your taste buds. Also, visit the popular attractions in the city by following Beijing itinerary 4 days. 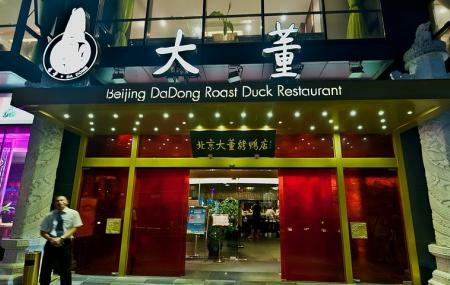 How popular is Da Dong Roast Duck Restaurant? People normally club together Temple Of Heaven and Lama Temple while planning their visit to Da Dong Roast Duck Restaurant. Beijing! There is so much to see and do, the locals are so friendly, and although language is a barrier, it should not stop you. There is a fair amount of english spoken particularly amongst the younger set. The Forbidden City, Tian'anmen Square, The markets etc are worth your time. We found bargining at the markets to be so much fun. Good food is easy to find. We stayed in the SunLiTan district which i would recommend, good shopping, cafes restaurants etc. Coffee can be a bit challenging, with the milk being UHT and a bit weird tasting, but i got used to it quickly. Starbucks was quite good. Make sure you try Dim Sum. Lots of great testaurants aroind, ask your hotel for recommendations. Up market Peking duck restaurant. Very extensively menu. The menu is as thick as a storybook! Hahahaha. Spoilt for choice! Good quality food and especially that fish soup we ordered was superb!! Be warned, it's not cheap here and service was not really that impressive. 1 lady was doing the cleaning and when we asked for the bill, she rushed over to attend to us and the rest of the service staff were talking over at 1 corner! Then we chanced upon Da Dong fast food chain serving the Peking duck at much lower price if you don't mind the ambience and just want a taste of their duck. Limited menu items of course! Excellent, high quality restaurant. Well known for their Peking duck but have an exceptional menu which is in itself a work of art and feels like it belong more as a coffee table photo book than a practical menu. Duck is super tasty. All the others dishes we sampled were also delicious. Definitely recommend this if you are looking for a fancy Peking duck experience in Beijing. Awesome selection. High quality food. Great prices relative to the United States. If you have the time, you need to try to place. Bottom Line: Must stop by and try!